Our touchscreen hire products are the best in the business. The sleekest designs, the most sensitive screens and reassuringly reliable. There are lots of touchscreen products out there. Some are better than others. At TouchscreenRentals.co.uk we only stock the very best touchscreen hire products. That means touchscreens with state of the art designs that look fantastic. It means super sensitive touchscreens that are just as sensitive in large format as an iPhone or tablet. It means tidy, all-in-one units with integrated PCs and Android Players, so there are no messy cables or external devices. Put simply, when it comes to touchscreen hire we really know our stuff, and high quality touchscreens are at the heart of what we do. Next in our touchscreen hire range are our giant-tablet style touchscreens. Forget touchscreens that look like TVs and aren’t responsive. 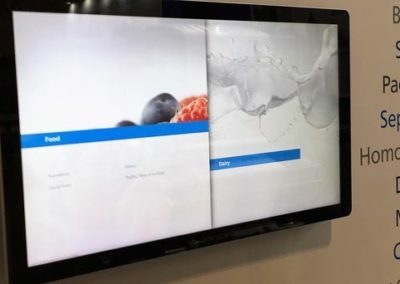 Our giant-tablet style touchscreens are the latest in touchscreen design, with no expense spared. 22″-55″. Sleek and modern. 10-point multi-touch with a tablet touch-experience. Integrated PCs with Windows and Android operating systems. Wow. We love them. We think you will too. Our touchscreen hire range starts with touchscreen kiosks. We focus on niche touchscreen kiosks and stock them in large numbers. 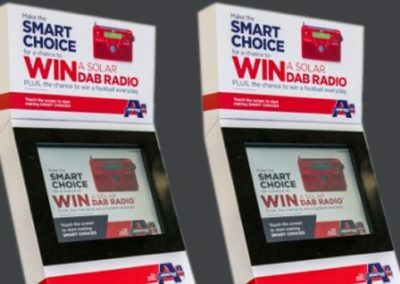 We are the only provider of the Slimline Kiosk, a sleek touchscreen kiosk with optimum branding space. 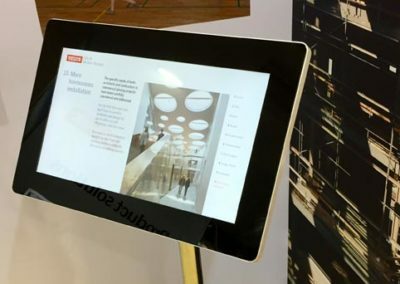 We are the exclusive touchscreen hire partner of Elephant Kiosks, enabling us to offer Europe’s most accessible and child-friendly touchscreen kiosk. The Slimline Kiosk has a sleek, modern design, with premium branding space. 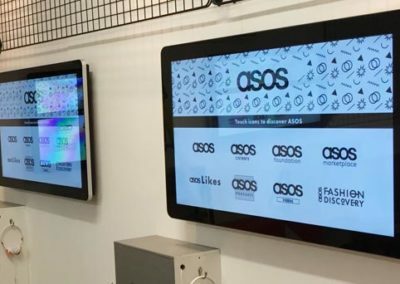 Finally, we offer bespoke touchscreen hire products. We know all the manufacturers and can source a full range of touchscreen hire products. We are experienced touchscreen designers. We design bespoke touchscreens to order, manufactured by our European partners. No touchscreen idea is too far fetched. We specialise in full-service touchscreen hire. Touchscreen hire is different to renting a TV or a monitor. First, there is a range of touchscreen technology and some is better than others. Second, touchscreens require a PC, whether it’s integrated as an ‘all-in-one’ touchscreen PC or whether its an external PC connected by cables. The PC not only has to work with the touchscreen, it also has to have the right operating system and specification to work with your software. Your software needs to installed, tested and configured. Touchscreens are trickier to set-up onsite too. Do you need to connect to the internet? Will the touchscreen autostart? Will the software be locked-down? Will everything work? At TouchscreenRentals.co.uk we take away the complexity of your touchscreen hire. We’re touchscreen hire experts. We make sure everything works perfectly so you get the best out of your rental. 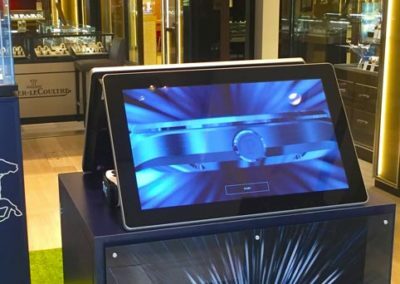 At the heart of our service is our touchscreen hire products. All our touchscreens have integrated high-spec Windows 10 PCs. Our giant-tablet style touchscreens also have an integrated Android player to display your Android apps. We advise you on what touchscreen hire products would be best for your project and give you ideas to get the most out of your rental. We offer touchscreen software development and applications, so when it comes to you installing, testing and configuring your own software you are in safe hands. We’ll even do that and send a video of everything working before you book. Once you have booked, we’ll deliver your touchscreen hire products on the day and at the time you specify. That’s 24 hours a day, 7 days a week, 365 days a year. When we say deliver we don’t just mean dropping of your products and leaving you to figure out the rest. Our installations engineers are highly trained touchscreen hire experts. We’ll unpack and set-up your touchscreens. We’ll connect your touchscreens to the venue internet. We’ll set up your software. We’ll test everything to make sure it’s working. We’ll tidy everything away and clean your touchscreens before we leave. During your touchscreen hire our support team will be on hand to provide remote support for any queries. Prior to delivery every touchscreen goes through extensive testing and quality assurance. So the chances of there being a hardware fault are as slim as they could be. Nevertheless, if there is a hardware fault during your touchscreen hire we’ll visit you to rectify it. We’ve only had one fault since we began in 2013 and we repaired it the same day! Finally, at the end of your touchscreen hire we collect at the allocated time. We package everything up and remove your touchscreens, so you don’t have to worry about a thing.